Im still excited about this thus it will be pretty unhistoric. But we will get bf1918 in awsome grafics! Imagine these biplanes,so cool! Finally not some jets but biplanes! Totally new sounds of airplanes and guns,no stupid fast crap guns. And actually WW1 game in Battlefield,till now we had bf1918 and dead NoManLand-mods.. It is called immersion. I've been to some sand dessert and the sunlight reflection from the brightly-coloured sands are spectacularly blinding. Without proper sunglasses, you will catch cataract. Also, from real life shooting experience, those gun powder residue is irritating for eye, no wonder real life soldiers wear goggles. To appease him (Natty) more let's be a little bit positive. This game looks awesome, especially the concept. It is a departure from tired futuristic warfare that doesn't dare to innovate much more from the current one. It is too much about individual isolated combat situations. There is no feeling of epic-ness of a battle. Meanwhile, Attack at Verdun or Somme would be massive and grand in scale. I hope DICE is able to re-create such epic atmosphere in this game. Let's hope for new engines as well. I want to get it all muddy, so when we run across the no man's land, a recently shelled ground will be slushy, softened, and slow us down with the effects visible on our boots. Sea battles! I don't need realistic scale of the battleships, cruisers, and destroyers, just relative scale is enough. And then all we need is epic sound and visual effects. We are all set. I'll see how it turns out. Maybe this will be my first BF since the let-down that 3 was. I'm really curious about the land vehicles. I mean, what will the counterparts for the buggy, Humvee, etc.. be? Armored cars? It seems that Dice has been taking the lead from the mod community. EoD got us BF Vietnam. Desert Combat became BF2. PR inspires BF3 and BF4, maybe. Now they are making BF 1918. I hope they release a BF Pirates inspired title. 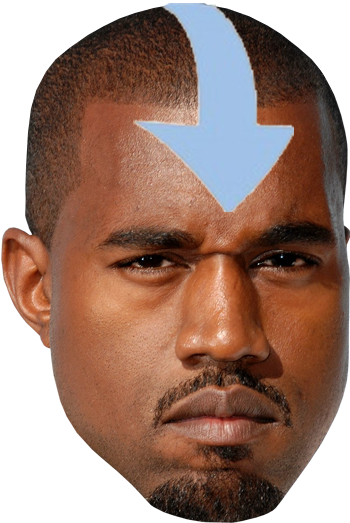 That will always be my favorite. I also hope that their engine does horses at least as good as Mount and Blade. lets see..black guy with cape holding german pistol...it seems this gonna be soooo realistic..
What is Ottoman Army/Middle East/African front? black guy with cape holding german pistol...it seems this gonna be soooo realistic..
Germany used to have this thing called "colonial empire" and in battles fought in the colonies you would actually expect the majority of soldiers to be locals (with only officers and NCO's from Europe), and most of German colonies were in Africa... 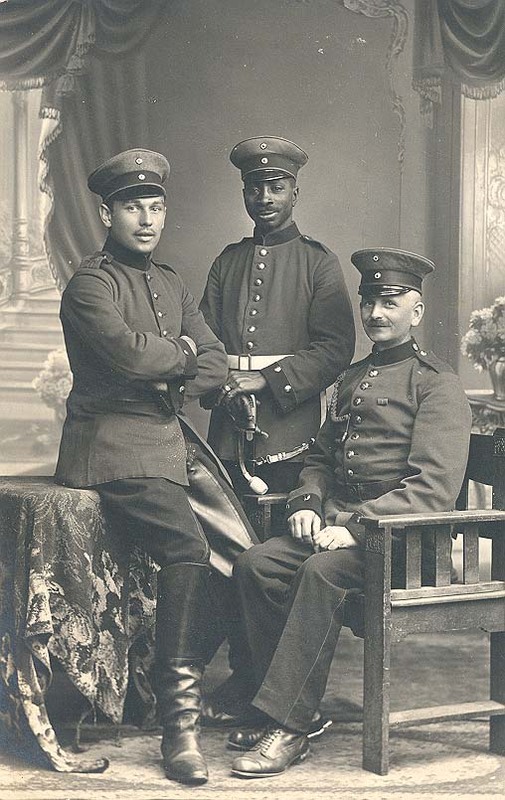 Being an Empire, there was also a number of black Germans living in Germany too, and when the war came, they were drafted into the army just like everyone else. Even the Third Reich, despite the race laws, accepted persons of colour (among other minorities) into arms (and there were actually even more black Germans now, since Rhineland had been occupied by French colonial troops). There were black soldiers even in the Waffen-SS, for crying out loud (OK, technically non-Aryans weren't members of the SS, they just fought under its command wearing the same uniform, which is just about as hypocritical hair-splitting as you can get). Late war or early war? I get the sense that the SS and Wehrmacht only "open for all" during their desperate later era. I know that in WW1 they use a lot of colonial troops. But that's after Kaiser Wilhelm II get over his "Yellow Peril" crusade and pinned by Russia and the West. Race politics might not be as prominent as in WW2, but old time Germany is old time Germany. 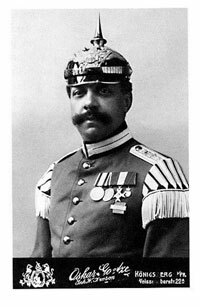 First of all, there were tons of black soldiers in the Kaiser's army, though most were indeed askari in Africa. That said, there WERE blacks who made it to Germany as citizens and were duly conscripted like any other. I don't know of any who became officers, but I have seen photos of guys who at least made it to high ranking NCO ranks. Also many in cavalry units were used as drummers. That said, they did see combat on the Western front for those who were already in Germany, and were not in any way segregated or disallowed from promotion. As for WW2, there were no blacks in the SS that I am aware of, however there was a Heer unit raised in North Africa that later served as occupation troops in Crete that did have at least a couple blacks. Also, blacks/mixed race Germans eho lived in Germany pre-war, it really differed from district to district whether thye were sent to concentration camps, disallowed from service, or, in very rare cases, drafted with everyone else. It should be noted as well that most of the so-callled Rhinland Bastards, children of white Germans and lccupying French Senegalese post-WW1 were castrated by the Nazi government. So basically, yes, in theory, you could play as a black German on the western front and be correct. However I highly, HIGHLY doubt that DICE has seriously gone through that kind of reserach. He is probably either representing someone on the Arabian Front, or a Harlem Hellfighter given that both have been announced as game content. We already have Hollywood movies depicting black Americans impressed by non-segregated European armies. 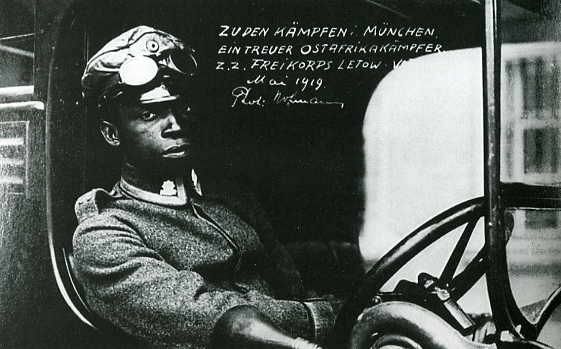 Also a National Geographic WW1 documentary depicting black German fighting in mostly white German units. And that anecdote that Hitler shook hands with black American Olympic Gold medalist, urged by Goebbels, while President FDR in the still segregated USA refused to do so. 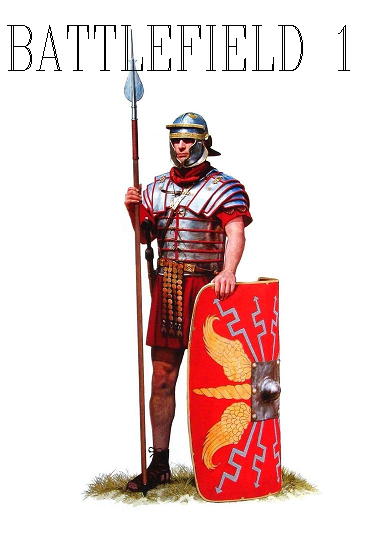 Also Askari (probably from the Arabic word Laskar = warrior) has been existing since World War 1? I thought it was WW2 thing. And that anecdote that Hitler shook hands with black American Olympic Gold medalist, urged by Goebbels, while President FDR in the still segregated USA refused to do so. I read that Hitler didn't shake hands. Not only not with the black winners (like Jesse Owens), but with nobody. He just didn't shake hands with the winners. Period. Actually he acknowledged him in his after event speech whereas the US guy refused to or something along those lines. VonMudra prolly knows this. Yes, Askari were a pre-WW1 thing. 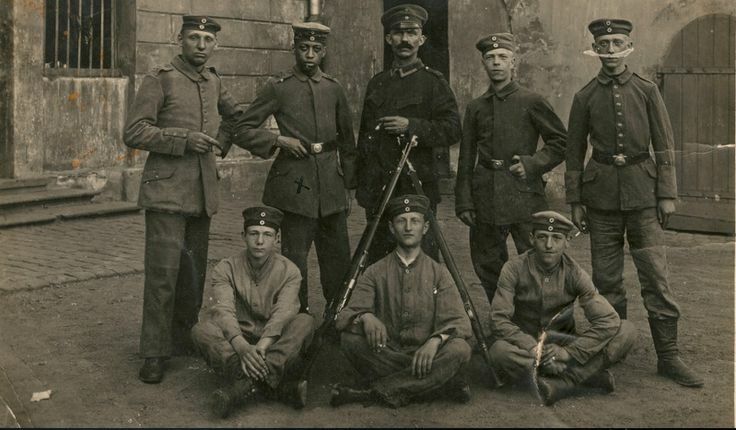 There were, as I said, black Germans fighting in white German units- the Germans didn't have a segregated military, just there were very very very few blacks living in Germany proper at the time. 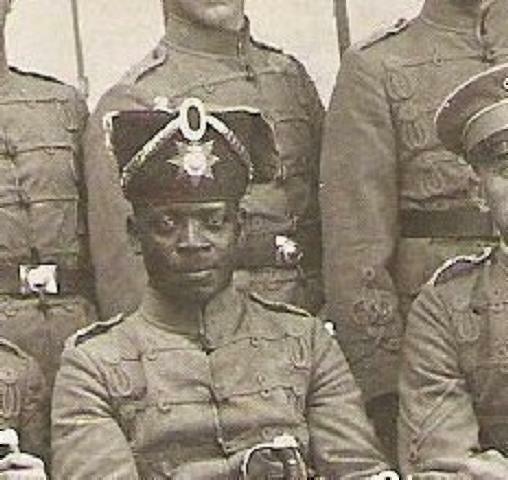 Hell, I have even seen a photo, that I wish I could find again, of a black Austro-Hungarian soldier. Hitler, according to Owens, afforded him full cordiality. FDR never got around to sending a congratulations because his secretaries said he was too busy.